SOUTH BEND, Ind. — After more than three hours bearing the cold, USC needed one more second, one more play and one more stand. The Trojans defense held strong on three straight passes to the end zone to stave off a furious Notre Dame comeback, securing a 34-27 win Saturday against the Fighting Irish at Notre Dame Stadium. 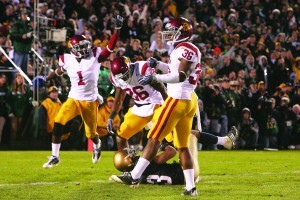 The win was USC’s eighth straight against Notre Dame. But unlike the previous three routs by the Trojans, Saturday’s game resembled the 2005 “Bush Push” game that was defined by a final dramatic drive. Notre Dame took three potentially game-tying shots at the USC end zone, from the Trojans’ 4-yard line, but couldn’t complete the comeback. With nine seconds remaining, Notre Dame tight end Kyle Rudolph fought for a jump ball with USC cornerback T.J. Bryant in the corner of the end zone but was ruled out of bounds. On the next play, USC cornerback Josh Pinkard knocked down what he thought was the final play of the game as his teammates spilled onto the field to celebrate. But officials ruled that there was one second left on the clock, setting up USC’s defense for one final stand. “Whether we had to go back again or not, that just doubled the fun of trying to get it done,” USC coach Pete Carroll said. A pass intended for Notre Dame wide receiver Duval Kamara fell to the ground to clinch USC’s win. 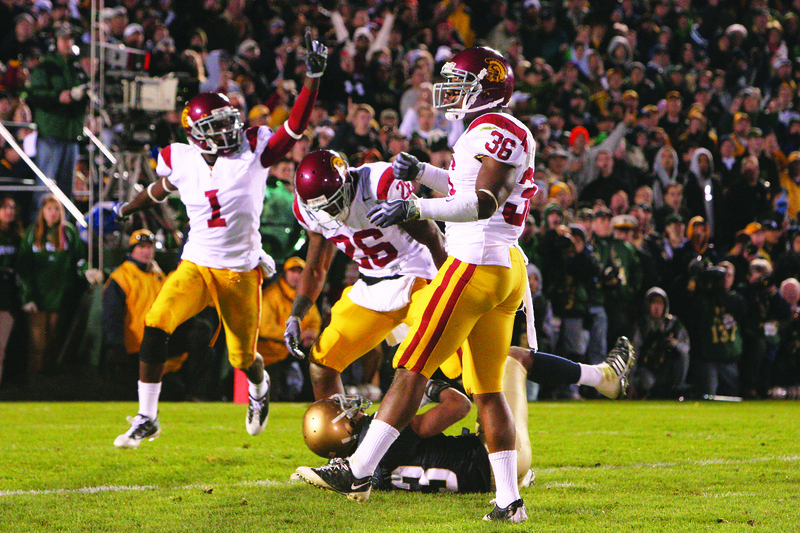 The last-second finish was unexpected for a USC team that had led 34-14 at the beginning of the fourth quarter. The Fighting Irish reeled off two quick touchdowns and came up with game-changing defensive plays, however, to keep the game competitive. 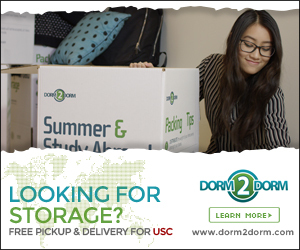 USC appeared to have the game in hand at the beginning of the fourth quarter when it led 34-14. But Notre Dame quarterback Jimmy Clausen fought off a slow start to rally his team to within a few yards of the upset. The Heisman Trophy candidate connected with wide receiver Golden Tate on a 45-yard touchdown pass and found Tate again for a 15-yard score to draw the Fighting Irish within seven. Clausen finished 260 yards passing and three total touchdowns. His two touchdown passes were the first that USC’s defense had given up all year. But Clausen’s effort may have been eclipsed by USC quarterback Matt Barkley, who mirrored Clausen’s rise as a Southern California high school football legend. Barkley passed for a career-high 380 yards and two touchdowns on 19-of-29 passing. The true freshman tore up a blitz-happy defense that left itself vulnerable in the secondary throughout the day. Holding onto the ball until the last second, Barkley repeatedly found his two favorite targets, Damian Williams and Anthony McCoy, for big gains. After missing his first completion of the second half, Barkley completed seven straight passes for 195 yards. Both Williams and McCoy finished with more than 100 yards receiving on the day. Williams had two touchdowns, including a 41-yard jaunt on a screen when an unsuccessful Notre Dame blitz left the Fighting Irish undermanned on the perimeter. Carroll highlighted penalties and a lack of forced turnovers as two of the biggest reasons for the Trojans’ inability to close out in the fourth quarter. USC forced four fumbles but did not recover any of them. The Trojans committed eight penalties for 70 yards but were flagged frequently in the second half at critical junctures. Senior safety Taylor Mays and redshirt sophomore defensive end Malik Jackson both earned personal foul penalties on the final drive to shorten the field for the Fighting Irish. “I really think without the knuckleheaded 15-yarders that kept moving the football, we were going to be OK,” Carroll said of the final drive. For a Notre Dame team whose last five games have all been decided by seven points or fewer, the failed final drive was devastating. “We just were hoping that we would score, and when we didn’t, it was like someone drove a knife into our hearts,” said Notre Dame linebacker Brian Smith. The frigid weather and close finish may not have been to the Trojans’ liking, but the atmosphere served as an initiation into a storied history for many of the players. “I kind of understand now why this rivalry is so big,” Barkley said. Which is the Pac-12’s top program? Ahhh! The Trojans finally came to play in earnest. It was awesome to see the defense pull together at the end. Job well done! !